The quadruple World Champions have it all to do again and never a team to rest on its laurels I see no reason why they won't be mixing it at the front once more. Their meteoric rise was of course by no means a fluke and took huge investment, the forming of great technical partnerships, an army of staff dedicated to the cause, the taking of calculated risks and of course huge ambition. Often seen as just the 'party team' in the early days they entered the sport at just the right time but bore the tedium of 4 years of poor results as they tried to catch up with the more structured elite teams. The regulation changes of 2009 changed the face of the sport in a way that was conducive to the direction they had taken and fitted perfectly with Newey's aero driven mindset. Of course without other key members like Rob Marshall and Peter Prodromou and a fantastic array of staff under their lead things may have been different. The RB10 then has a challenge on its hands as all the other teams have their sights firmly set on knocking the team down a peg or three but rest assured the boys and girls at Red Bull won't go down without a fight. The first striking point about the Front Wing is the change in approach at the Endplate, featuring a curving slot as the base of it will allow airflow to pass from both sides of the Endplates but airflow will predominantly feed outbound around the front tyre. 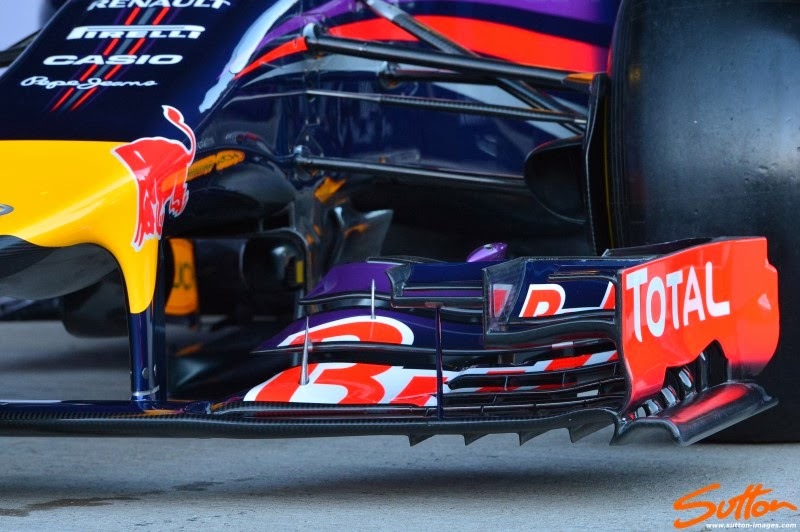 The front lower edge of the Endplate also features a curved section which again will influence the airflow aft of it. From the angles available at present it's unclear if it's a 6 or 7 tier wing but I'd hazard a guess at the latter. 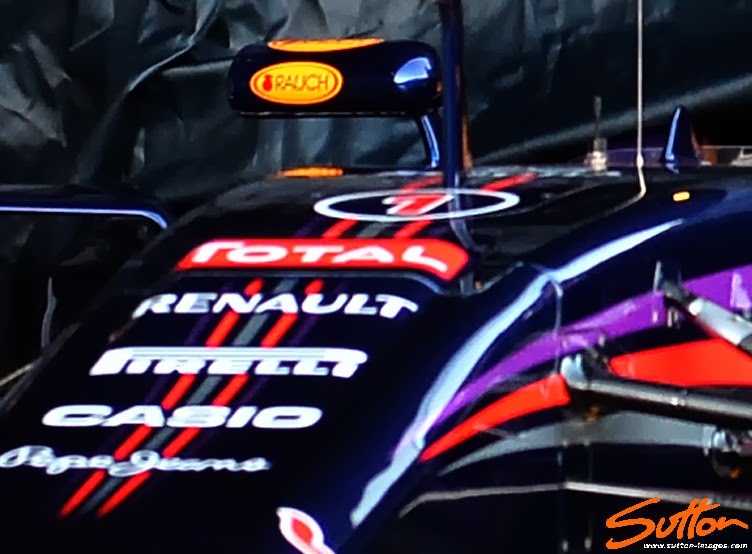 The RB10 is another to feature the 'Finger' nose but approaches it several different ways to the ones we have seen so far. backwards toward the outstretched nosecone. The lower shape of the nose also tapers from the tip clearing as much room between it and the Mainplane below as possible. The nose tip is populated by a cleverly designed inlet that maximises both the opportunity for it to be used as driver cooling but also mitigate any aero issues by placing just an open inlet in that position. The airflow otherwise confronted there onwards by an expanse of bodywork is treated to a 'Pelican' underbelly (outlined in Green) that facilitates the speeding of the airflow rearward and towards the central 'S' Duct. 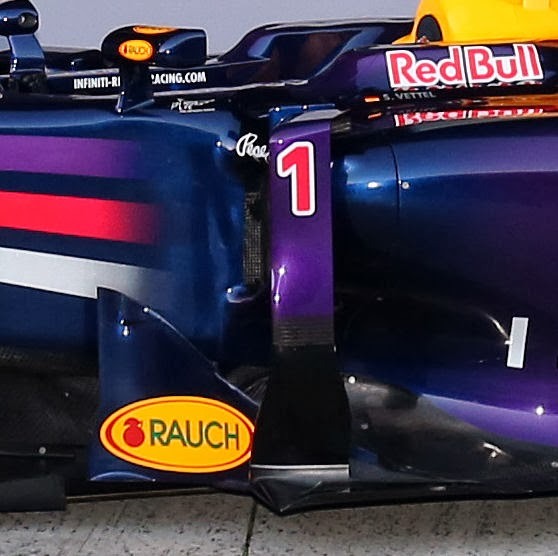 A relatively small inlet means the RB10 also features a large undercut for which the airflow can make it's way to the rear of the car. 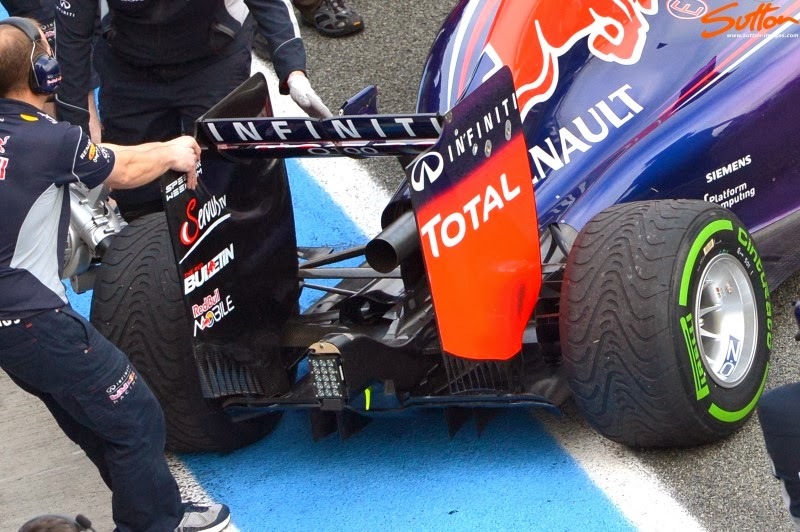 Sidepod Airflow Conditioners, Slotted Bargeboards, Detached leading edge Floor Scroll and Horizontal Cockpit Vortex Generators are all carry over from the RB9 at present but may change before the season gets under way. 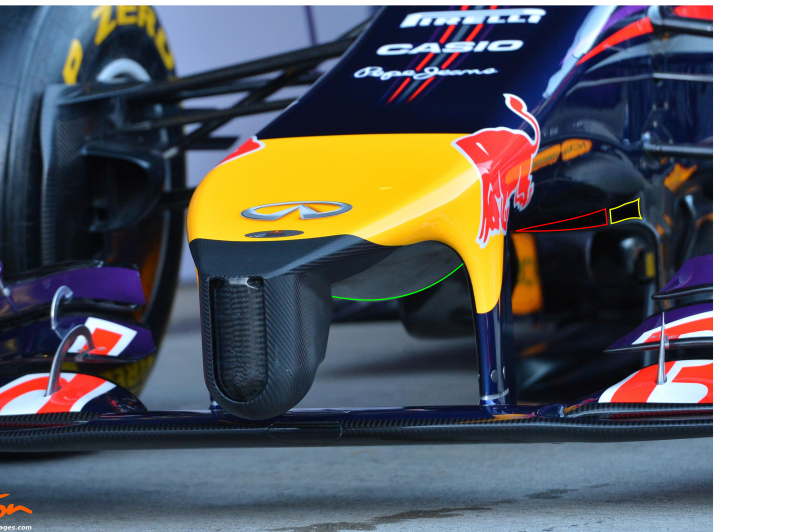 If it isn't broke don't fix it seems to be the the moto at Red Bull as the intrinsic design layout of the Airbox is very similar to it's predecessor. Unlike Toro Rosso the team haven't felt the need to add a scoop underneath the main airbox and instead retain the undercut for cleaner airflow. Using a mounting pylon affixed between the upper section of the Engine Cover and wings Mainplane for rigidity I'd have expected a rather aggressive Endplate design. Aggressive it certainly isn't, moreover it's devoid of many of the regular design considerations that are usually seen by the leading teams. 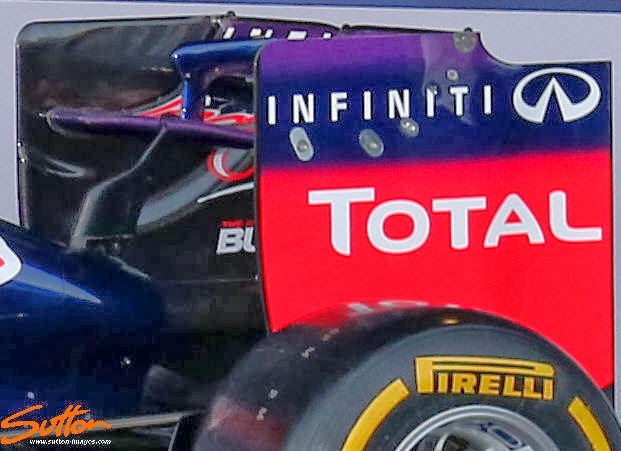 One would have to assume that many of the items on the RB10 are simply placeholders and instead the team are simply working on getting the bugs out of the car before really looking at performance. Compared with it's sibling (STR9) the rear of the car seems incredibly rudimentary, devoid of lots of the aero tricks that even the STR9 features. 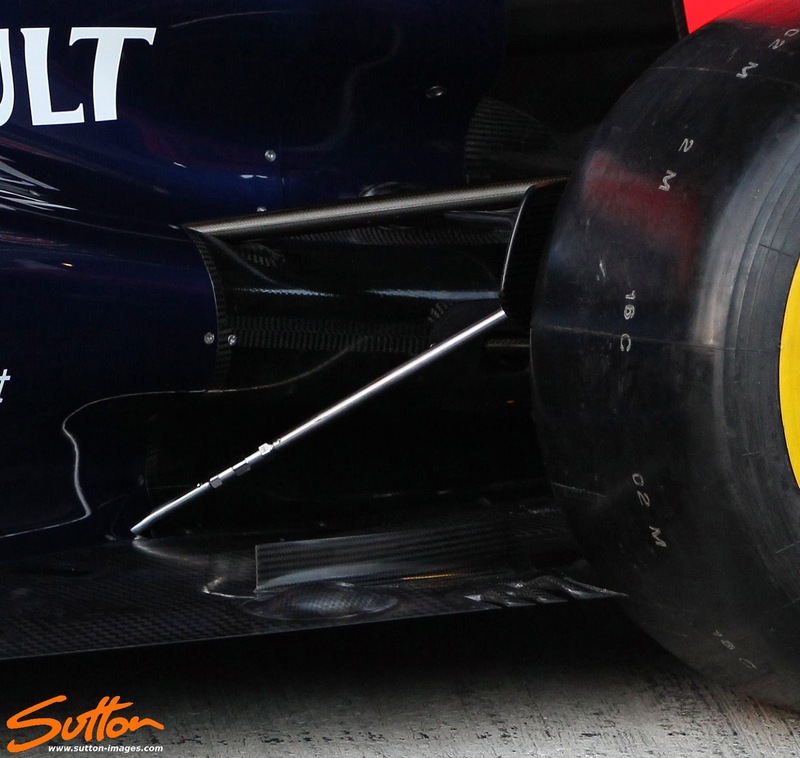 The RB10 retains it's enclosed halfshaft lower wishbone arrangement which cleans up the airflow over the floor. I will of course update the article as soon as the team decide to pop some actual parts on the car. I really enjoy your write ups. Ill be interested to see your thoughts on that Caterham nose! 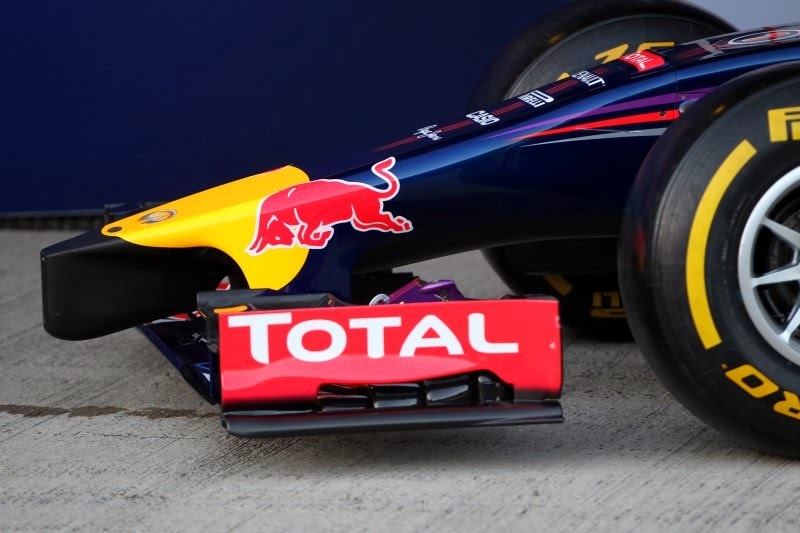 Does that rear wing pylon on the RB10 have potential for being a passive drs duct? "I will of course update the article as soon as the team decide to pop some actual parts on the car." < < < hehe you're funny as hell, Somers! I might just have to turn off my adblocker when I visit your site - your dry humor is good enough, we want to keep it around!!! lol cheers! Matt, thanks for the analysis, as usual! What's your take on the missing camera mounts on the front of the car? 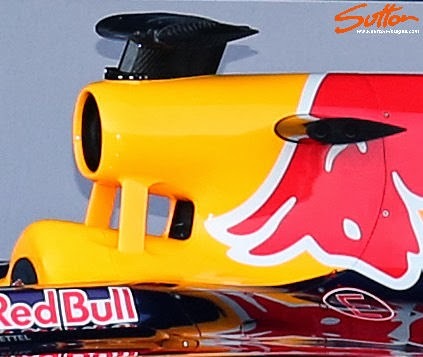 I noticed that Red Bull was the only team to have cameras at the side of the airbox, however none at the front. Hole in the regulations?